Some of the more recent Amouage fragrances for women — Memoir, Epic, and to some extent Lyric — are built like battleships. They’re weighty and loaded with moving parts. Amouage Interlude joins the fleet. The trick in this type of fragrance is that as its intricate machinery clicks and whirrs through its gears, dozens of potentially disparate notes need to engage and dissipate in combinations that evolve artfully. Interlude Woman is an opaque, autumnal perfume that doesn’t suggest “floral chypre” at first sniff. 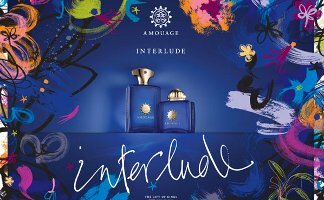 Neither does it evoke (to me, at least) the “interlude moment of unity and sentiment” Amouage’s beautifully printed marketing materials claim. Interlude Woman opens with an unexpected bright green, almost peppermint-tinged, citrus burst. Before long, the warm curry-maple syrup scent of helichrysum wafts beneath, then overtakes, the green opening and hums along to form the fragrance’s spine as long as Interlude Woman lasts on skin. Here’s where I think Interlude Woman fails. Just as the fragrance hurtles into its heart, a clash of notes stinking something like freshly manufactured synthetic patent leather arises, and for twenty minutes you smell like the manager of your local Payless discount shoe store. But power through the plastic bit, and Interlude relaxes into a velvety and balanced (but still big) blend of earthy coffee; warm, carnal helichrysum; buzzy jasmine and orange flower; and dried green herbs. Interlude becomes comfortable and easy. Further along, I swear I smell cardamom and absinthe. The fragrance eventually sweetens a touch and retreats to the skin. Unlike many fragrances with leather, the leather in Interlude Woman whispers through at least four hours of the fragrance’s six hours of life on my skin. Amouage calls Interlude Man a “spicy and woody fragrance.” Despite PR pap about chaos, harmony, disorder, etc, Interlude Man is well-mannered and lush. It includes top notes of bergamot, oregano and pimento berry oil; heart notes of amber, frankincense, cistus and opoponax; and base notes of leather, agarwood smoke, patchouli and sandalwood. Interlude man is a variation on the wood-amber-smoke-leather-tobacco fragrance that calls up smoking jackets, wood-paneled libraries, and cut crystal tumblers of Scotch. McGraw by Tim McGraw is a good drugstore example and Parfums MDCI Invasion Barbare a more upscale one. Amouage’s version in Interlude Man reminds me of delicious, sweet, creamy coffee soaked into pure sandalwood and luminous cedar. It’s not terribly original, but neither is crème caramel or meet-cute love stories, and I bet we’ll never get tired of either of those. It lasts a good eight hours on my skin. One more thing — Interlude Man leaves out the lavender and other “manly” fougère notes that might scare some women away from trying it. I bet it finds a solid audience among women who weren’t smitten with Interlude Woman but love a warm, woody, ambery scent. Amouage Interlude Woman Eau de Parfum was developed by perfumer Karine Vinchon Spehner; it is $250 for 50 ml and $290 for 100 ml (making the 100 ml bottle the way to go if you truly love the fragrance). Amourage Interlude Man Eau de Parfum was developed by perfumer Pierre Negrin; it is $225 for 50 ml and $275 for 100 ml. For information on where to buy Amouage Interlude, see Amouage under Perfume Houses. Great reviews Angela! Well done! When I was reviewing Interlude duet at Chemist in the Bottle I, like you, came to conclusion that Interlude Woman is much more complicated than Interlude Man and that female one is more interesting. Now I’m looking forward for their launch of Beloved Man and Opus VII (just read about them at Persolaise) + they’ll probably prepare something EXTRA for their 30th anniversary. Everyone has been raving about Beloved, but I haven’t tried it yet. Maybe someday! And like you, I’m looking forward to smelling what Amouage does for their 30th. I adore both of the Jubilations. I haven’t tried Beloved either. Not available here. But I’m hoping to smell it along with Beloved Man one day. This is the first time I see the ‘floral chypre’ description and I’m sat here scratching my head. Really? My impression was dense and resinous but “opaque” is an excellent description too. I’m a huge Amouage fan but found Interlude a disappointment. Shame, since the blue and gold bottle is so beautiful. Funnily enough, this mirrors my experience with Nuit Étoilée – gorgeous packaging, strange (and once again, resinous) juice. I love the color splashes on the Interlude marketing. Something about that dark blue and coral really appeals to me. I *liked* the battleship simile! Great reviews! I almost piled on another comparison of smelling Interlude Woman to looking through stacked stained glass windows, but I pulled the plug on that one! Sounds appropriate though. You excel at visual images for us, and we’re grateful. You are very kind–thank you. I was sent a bit of Interlude Woman by a perfume fairy godmother shortly before the holidays. I knew nothing about it. At first sampling I thought, “coffee cake”. Then after a bit, “coffee AND cake”. Then it seemed as if there was a whole lot going on with the fragrance behind the scenes – I’ve never experienced that sensation before, with any perfume. As if there were lots of other notes present in the background but I couldn’t actually smell them because of this big coffee & cake thing happening. I’ve worn it a few times since and have come to really like it, and to actually kind of crave it, but I work hard to distinguish different notes and I’m still not sure exactly what I’m smelling. I wouldn’t splash out that kind of hard cash for a bottle, at any rate, but it is a fascinating kind of smell. Hey, a perfume fairy godmother? That’s perfect! Yes, there’s a lot going on in Interlude Woman until it settles down after an hour and melds into something more unified. It’s fun to try something so unconventional (yet not radical) just for the experience. I love what you say about fragrance notes that sort of stay in the background! Very evocative. I can really enjoy that sense, too. I feel that Memoir has elements that I could describe that way, and maybe Tauer’s Une Rose Chypree as well? It has a sort of fullness that never really diminishes, even deep into the dry down. I just didn’t get the point of either of these. Sadly, I didn’t like the Memoirs or the Opus Library scents, either, and maybe I haven’t given Epic enough of a chance – I know I need to give the women’s Epic in particular more skin time – but it seems to me like Amouage has lost its way a bit lately with too many releases. There was the brilliant opening shot of Homage, which, along with the Jubilation scents, revitilized the brand into something everybody held their breath for, and then they had the Lyrics and some excellent reformulations (of Ubar, for example). And then, suddenly, it all sort of went phhhht for me, and I stopped being interested. I don’t know why, because they’re hired perfumers like Jacques Flori, whose style I usually adore, but the latest ones all seem to me like a bunch of sound and fury, signifying nothing. FEEL FREE TO SEND ME ALL YOUR MEMOIR! My perfume-hating SO last night said for the first time “You were wearing something that actually smelled interesting yesterday – what was that?” It was the Memoir body cream. I’m so stunned I don’t know which way is up. I DO love Memoir, though. It sounds like you found a winner! Angela, nice, thoughtful and thorough review. My sink stopper has fewer ingredients, and I don’t wish to smell that either. You know, I was thinking about this as I wrote the review. Some of the grand old perfumes, like Bal a Versailles, had formulas as long as my arm. Yet somehow they smell more unified. Maybe it’s when the fragrance has a lot *obviously* going on that it becomes confusing, like someone who wears a mix of paisleys and plaids. Sometimes it comes off as chic and interesting, and sometimes as a mess. If you liked Bal a Versailles, you’ll like Beloved. Similar old school, vintagey, dusty, floriental with just enough dirtiness to make it great. I wear both, and love both. But it has about 30 ingredients, but all together it’s just incredible. It’s soothing in a way, uplifting, but not that blinding brightness, of, say, Ubar. It’s like remembering a past life that was all about comfort and simplicity and unending loving hugs and warm down quilts and great home-cooked food. It takes me away from the age of texting and internet (ironically) and stuffed up traffic and ridiculous public figures. Can’t explain it. Like an old 19th century Victorian house with the charm, but it has all new appliances and no bad wiring. When you get a chance, try it. Incomparable. You’re killing me! It sounds like just my thing. I must try it. Oh shoot. I really wish I hadn’t just read that! You make it sound divine! Angela, I totally agree- Interlude Man is a delicious men’s fragrance for women. There have been a few very positive reviews of Interlude Woman recently, making me wonder if I had missed something. Your review reassures me that I did not. And your comments reassures me I’m not alone! It’s always a little hard to post something critical about an established perfume house that obviously uses such fine perfume materials. But I guess it’s all a matter of taste…. I need to test both of them again. I thought they both smelled wretched on my skin, but quite sufficiently interesting, if not attractive, on paper. But so many people have lauded Amouage Man that I feel like I need to wear it again. More than a few perfumes I’ve fallen in love with only after a few wearings. As always brilliant review Angela! I love your metaphors – the sailing ships, Eve seducing Adam in with Jubilation 25 in the garden of Eden… They always make me smile because they are so adequate! As to Interlude Woman I’m so glad you mentioned the synthetic part as I thought it was my vivid imagination telling me I can smell ‘a kind of glue’ but nor being entirely sure what kind of glue! Unfortunately for me (but fortunately for my purse) the ‘glue’ note doesn’t go away and stays forever right next to the coffee note. So while I find Interlude Woman intriguing and unique it won’t be joining my small collection. Beloved is so darned difficult to get a sample of! But you can bet that if I do, I’ll definitely review it. Beata, would it be tactless to ask if I could get a sample of Beloved too? Quality Missala which carries Amouage in Poland doesn’t have this perfume in their offerings. Beata, you are terrifically kind to do that. Please don’t go to any trouble, though. If it does happen that you stumble upon an extra sample, let me know, and we can arrange a swap. I must have at least a few things in my perfume cabinet you might like to try. That won’t be trouble at all, believe me, only a very convenient excuse to venture to Harrods, try to get samples and smell something new – Jour d’Hermes being on the top of the list . I’ll get in touch with you. You’ve definitely piqued my interest in it! Compelling article. Angela you are a great writer. Just superb. I’m going to enjoy my Lyric and Gold. I wain for Memoir. Thank you! You are so nice to say so. I received samples of Interlude Man & Woman. I really loved Man…funny, I tried it on at the end of the day at work, and someone asked me if I was burning a vanilla candle! I did not think it smelled so vanilla…go figure? Woman was a little tougher…I just did not like it as much at first. It was just too much. After awhile it was OK, but still liked the Man better. Interlude Man is an easy fragrance to love, that’s for sure! Well you and Victoria have saved me the effort of trying this one. She didn’t like it either. So thank you! I have tried a few Amouages but so far have only really fallen for Gold. I also liked Dia but not as much as Gold. Ubar I could admire but is not to my taste. I suppose the house’s style is not much to my liking but Gold oh Gold, I would love to own a bottle of that. You’re lucky in not getting sucked into the Amouage vortex! It’s a real money saver. A bottle of Gold might be worth saving up for, though. Have you ever tried the extrait of it? I am only familiar with the Eau de Parfum. I’ve only tried the EdP, too. It sure feels as rich as extrait, though. It so does! I may actually faint trying the extrait. And yes I am saving up for it. I ordered my samples last week from Aedes, and I’m eagerly awaiting their arrival! My impressions when we got that first sniff at Our Lady were very positive for Interlude Man. I feel like my nose was stuck to that little dab of smooth smoke/leather/incense! Strangely, my thoughts on Interlude Woman were that it was boring–sounds like that may change when I have more than a drop to huff?! My guess is you won’t find Interlude Woman boring–but as to whether you’ll like it or not, who knows. Let me know what you think, though! Your review makes me want to re-try Interlude Man. I got a sample from Lucas (I won his blog’s first draw!) and while I liked the scent and it stayed with me just about the entire day, I was sneezy the first 10 minutes of wear. I have (had) a small decant of Interlude Woman and actually liked it so much that it is almost drained. I have a back-up generous sample of it so would not have to go without. I haven’t explored enough Amouages to decide my FB-worthy favorite…they are just too darn expensive! Trying them can truly be deadly to the bank account!